Almost exactly one year ago, in the NFC Championship game against the Packers, Russell Wilson flirted with the title of “Worst Playoff Performance in History”. However, staunch defense, a late rally, and some good fortune on an onside kick kept the game close. This allowed Wilson to redeem himself with some big plays late in the game, ultimately punching the Seahawks’ ticket to Super Bowl 49. I’ll identify a few key plays, comparing the impact of Wilson’s passer rating with the Seahawks’ win probability. Wilson’s first pass attempt of the day was intercepted and returned for a touchdown, plummeting Seattle’s win probability to 10.5%. After his second interception of the day, Seattle’s win probability slipped even further to 1.1%. Finally, the Seahawks went three-and-out on their next possession, before Carolina scored their final touchdown of the day to go up 31-0, bringing Seattle’s win probability to a remarkable 0.1%. To recap, Wilson and the Seahawks had mathematically been all but eliminated from contention after only 7 dropbacks. Of course, other elements of the game contributed to this deficit, but Wilson’s performance left a lot to be desired. In his first 7 dropbacks, Wilson recorded an adjusted passer rating of 0.0, the floor for the statistic. However, Wilson’s final passer rating hovers just below 80, which, while certainly not good, does not guarantee a losing effort. 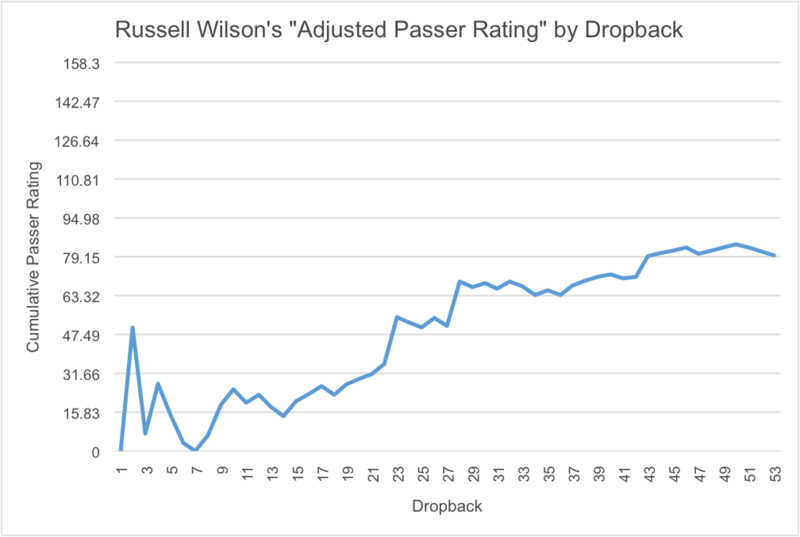 In fact, on his last 46 dropbacks, Wilson recorded an adjusted passer rating of over 105. As a result of his improved performance, the Seahawks were able to make the game competitive again. After kicking a field goal to make the score 31-24, Seattle’s win probability had recovered to a respectable 6.99%. For the second straight postseason, the Seahawks had a chance to recover an onside kick in a playoff game to complete a dramatic comeback. But miracles are in short supply, and falling behind big in the playoffs will lead to elimination more often than not. Now, none of this is particularly profound. Most casual football fans already know that good quarterback play is key to winning football games, that coming back from a 31-point halftime deficit is very hard to do, and that you can’t bank on recovering an onside kick in two consecutive playoffs – especially not after getting bailed out by a miracle the week before. However, the visualization is astonishing; Wilson’s rating starts low thanks to his disastrous opening set of plays, and in this time, his team’s win probability drops into the single digits. Despite turning his performance around and continuously improving throughout the game, Wilson’s effort was not enough to send Seattle to the NFC Championship. Make no mistake, losing by just one score on the road as a playoff underdog is certainly a respectable day. Yet, Seattle’s inability to recover from their slow start seems to imply something about the value of elite QB play relative to poor QB play. Wilson was bad for just 7 plays and elite for the remaining 46, but the timing of these plays left Seattle with a statistically improbable chance of winning. Elite play, even on 86% of his dropbacks, was only good enough to bring the team’s win probability closer to “highly unlikely”. At this point in the season, every team is in “win or go home” mode, and the Seahawks’ early struggle made going home the much more probable option. So, the final takeaway is that, despite a quarterback’s best efforts, things will go wrong for every football team, but if everything goes wrong at once, then winning becomes practically impossible. For this statistic, we simply count every sack as an incompletion and deduce the yardage lost from the net passing yards. Then we run the standard passer rating formula, but replace attempts with drop-backs and passing yards with net passing yards. Note that with NFL passer rating, 158.3 is the highest attainable score, while 0.0 is the absolute worst. Spiking the ball every play would yield a rating of 39.5. Aaron Rodgers is the all-time career leader in passer rating with a 104. So Wilson ended the day playing some very good football. GO HAWKS!!!!!! Never give up. See you next season.